The signs of adrenal fatigue can come on suddenly, but the condition will have been present for a while, though you may not have noticed it. This is typical because adrenal fatigue often presents itself as a hormonal crash, when cortisol is produced at a lower rate than normal and the body and mind collapse in fatigue because the system has been running too high for too long. Most conventional doctors do not recognize the signs of adrenal crisis and do not believe adrenal fatigue to be a valid medical issue, so seek the advice of a naturopathic doctor. Alternative medicine may help pick you up from your run-down and over-stressed state and get you back to feeling normal again. It can take quite a long time to heal the symptoms of adrenal insufficiency, but it’s possible. Have you been feeling more tired than usual lately? Maybe you can’t seem to get back the energy you once had, or the days seem unbearably long to you, or maybe you feel off-balance or dizzy at times. Perhaps headaches come and go but more so than normal, or you’re feeling anxious and are having bouts of insomnia. One of the hallmarks of adrenal failure symptoms is a change in blood pressure, whether that’s higher or lower than normal, though it’s usually seen as a spike because of higher cortisol levels at the start of an adrenal crisis. A low cortisol level is more common in the later stages of adrenal fatigue, and that’s why people feel tired, but a high cortisol level can also be present during the day, which will increase blood pressure. Monitor your blood pressure a few times a day and chart it so you have a long-term record. Weight changes manifest themselves as a sudden increase in weight. You may also find yourself craving certain types of food, especially salty foods. Most people with adrenal fatigue issues have low cortisol levels. Cortisol is the hormone our bodies use to fire us up and stay active and alert throughout the day, so low cortisol can make you feel sluggish. This symptom can present itself in a few different ways. It’s not just an inability to think clearly; it can also show up as racing thoughts or difficulty focusing or staying on task. Even though you might sleep soundly for eight hours, you still wake up feeling exhausted, as though you pulled an all-nighter. Conversely, when cortisol levels are high, you may find that you can’t sleep and are waking up several times throughout the night. The signs of adrenal fatigue in men are no different than they are for women, minus one glaring biological difference that’s applicable only to women: possible early menopause. Eliminating foods that stress your system and tax your adrenal glands, such as caffeine, sugar, processed foods, and hydrogenated oils. Taking supplements can also help restore adrenal function, such as fish oil, vitamins B5, B12, C, and D3, magnesium, zinc, holy basil, and ashwagandha. Lastly, reducing stress is vital. Some stress-reduction ideas you can try range from simply resting when you feel tired (too often, we keep going despite exhaustion and don’t take care of ourselves) to avoiding much larger stressors, such as family politics. More stress-reducing ideas are below. Avoiding negative people—surround yourself with those who see the good in life, and while you’re at it, avoid negative self-talk as well. While exercising is a good idea for many reasons, try to avoid highly competitive sports situations—you’re trying to relieve stress, not add to it. Signs of adrenal fatigue recovery will essentially include a return to a feeling of normalcy. You will be calmer, have more restful sleep, and if panic and anxiety attacks were a symptom, they will have disappeared or at least be much less frequent. Your diet and appetite will return, and above all, your energy levels will be restored and you will be ready to tackle life once again. “What Are the Symptoms of Adrenal Fatigue?” The Adrenal Fatigue Solution web site; http://adrenalfatiguesolution.com/adrenal-fatigue-symptoms/, last accessed April 6, 2016. “Signs and Symptoms of Adrenal Imbalance,” Women to Women web site; https://www.womentowomen.com/adrenal-health-2/symptoms-adrenal-fatigue/, last accessed April 6, 2016. 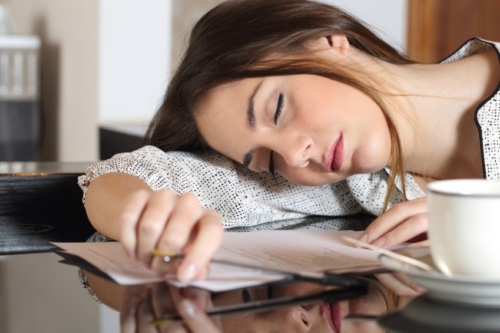 “75 Adrenal Fatigue Symptoms and Signs,” Dr. Lam web site; https://www.drlam.com/blog/75-signs-symptoms-and-alerts-of-adrenal-fatigue-syndrome-2/1970/, last accessed April 6, 2016. “Recover from Adrenal Exhaustion with Simple Lifestyle Changes” Integrated Wellness web site; http://integratedwellness.com.au/recover-from-adrenal-exhaustion-simple-lifestyle-changes/, last accessed April 6, 2016.